(Keene, NH) On April 12th, members of the Grand Monadnock Youth Choirs (GMYC) in grades 5-8 will be traveling to New York City for the Choristers and Elm City Singers Ensembles’ first concert tour. Inspired by the Cecilia Ensemble’s bi-annual international concert tour, the organization felt compelled to offer a performance-based travel opportunity to singers before they enter high school. This inaugural trip to NYC will mark an important milestone in GMYC history, now offering concert tours to all singers in grades 5-8 every other year. GMYC’s first-time New York City itinerary promises a full day of performances, singing workshops, and culturally enriching experiences across Manhattan. Upon arrival in NYC, singers will have their first performance at the Rudolf Steiner School, a Waldorf school in Manhattan serving children Nursery through 12th grade, based on the principle of integrating movement, fine arts, and practical arts into their academic curriculum. GMYC will offer a performance both for the students at the school as well as the general public. At the conclusion of the performance, Rhoades will teach the singers and audience a new song that will be sung together by all. Following the performance, singers will have time to break for lunch and walk through Central Park just in time to see the infamous cherry trees begin to blossom. This will be the first time exploring New York City for many of the ensembles’ members and offers an exciting opportunity for cultural engagement in a region so unlike many parts of southwestern New Hampshire and its surrounding areas. Following the walk through Central Park, GMYC singers will attend a private workshop with Francisco J. Nunez, Founder and Artistic Director of the Young Peoples Chorus of New York City. Nunez is a world-renowned children’s choir director and composer who boasts over 125 national and international concerts each year with YPC’s 1,700+ members. After the workshop, the choirs will participate in an exclusive combined choir rehearsal with YPC’s middle school aged singers. The choirs will perform for each other, exchange gifts, and sing one piece together, led by Nuñez himself. After the combined rehearsals, singers will experience Times Square, Rockefeller Center, peek into St Patrick’s Cathedral, and have dinner together before returning home. The Grand Monadnock Youth Choirs is able to offer this music, performance, and culturally based opportunity to Choristers and Elm City Singers through generous donations from the New Hampshire Charitable Foundation, the Putnam Foundation, Douglas Toys, and several private donors. If you would like to contribute to the GMYC NYC concert tour, donations can be made here or as a check payable to Grand Monadnock Youth Choirs with NYC Trip as the memo. All donations tax deductible to the fullest extent of the law. The Grand Monadock Youth Choirs a 501c3 non-profit organization founded in 1997. It is the performance-based choral music education program for young singers in our community. GMYC is based in Peterborough and Keene and serves over 100 singers from nearly 20 towns across New Hampshire, Massachusetts, and Vermont. GMYC offers professional rehearsal and performance environments that foster musical expression, a deep appreciation of music, and meaningful, lifelong friendships. (Keene NH) For three weeks in September, Monadnock Region youth will have the opportunity to take the stage and share their singing talent at the 1st annual GMYC Singing Stars! Competition. The event will be held on Sunday, September 9, 16 & 23 from 3-5pm at The Marlborough House in Marlborough, NH. This is the first such event for the Grand Monadnock Youth Choirs (GMYC). As the only nonprofit children’s singing program in the Monadnock Region, GMYC was searching for a fundraiser that fit its mission of encouraging young singers who may be interested in genres other than choral music. Students (public, private and homeschooled) in grades 2-8 are invited to audition on Saturday, August 11 from 11am-1pm, and Thursday, August 16 from 5-7pm at the Waldorf School, 98 South Lincoln Street in Keene. Registration packets will be available on site; arrive early to complete paperwork. A non-refundable $25 registration fee can be paid online in advance or at the time of audition. Performances of up to 90 seconds can either be acapella, or accompanied by a backing track on a phone or CD player (bring your own CD player.) Experience is not necessary. There are two divisions. Younger children in grades 2-5 will compete as a Shooting Star, and youth in grades 6-8 will compete as a SuperNova. Criteria for scoring will be commensurate with age. Contestant notification will occur no later than Monday, August 20. In order to address first-time performers who might be nervous, scores from both Weeks 1 and 2 will be added together when choosing finalist performers from both divisions in the Week 3 finale. The audience will also be able to vote. Judges throughout the competition include Laina Barakat, Nicole Colson, Kristen Leach, Matthew McGinnis and Joanne Mead. Final scores will be tallied and winners will be awarded cash prizes and trophies at the September 23 finale. Professional sound and lighting will be provided by Erik Burke and Aime Theroux, and the event Emcee is local personality, Wade Garrett. Snacks and drinks will be available. It was with profound respect and delight that the Grand Monadnock Youth Choirs (GMYC) decided to participate in the global birthday musical celebration of Nelson Mandela’s 100th birthday! 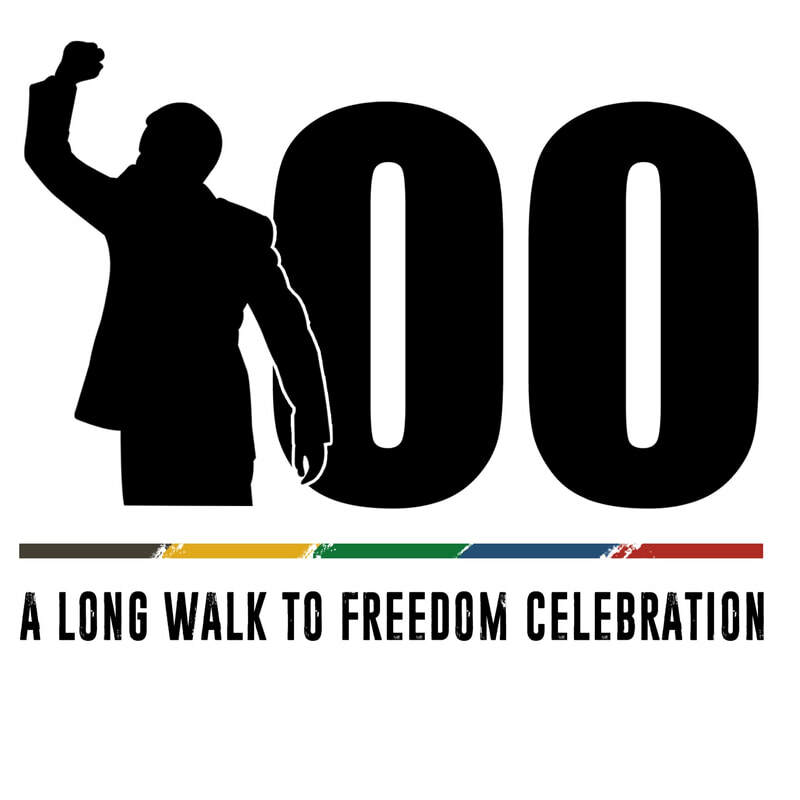 Each year, the legacy of Mandela is celebrated worldwide on July 18. We collaborated with the South African Consulate in New York City, who offered personal greetings, and the Nelson Mandela Foundation in South Africa who agreed to endorse our involvement as a global partner. Nelson Mandela’s message of peace, hope, love for the children of South Africa is the cornerstone of these events around the world. Mandela is quoted as declaring, “Education is the most powerful weapon which you can use to change the world.” His philanthropic will is well established in his post-presidential office with a focus of “liberating children from poverty through improved literacy.” Since 2011, the Mandela Literacy Project has provided more than 100,000 South African children daily access to reading materials through containerized libraries with an additional 100 000 having access to reading clubs and books. Here in Keene, we decided to host our event in Central Square. About 100 people attended to declare their belief in Mandela’s legacy, enjoy a concert by singers from all five GMYC choruses, and conclude the event with a piece of birthday cake! GMYC’s commitment to young singers has been a driving force of the nonprofit since 1998. GMYC believes that, today more than ever, our youth need to be educated, respected, supported and loved by the adults in their lives. As American citizens, we must set an example of right relationship with one another. By celebrating Nelson Mandela’s birthday in southwestern New Hampshire, we join with millions of others across the globe who hold the same ideals and dreams for all our children. Our deep thanks to local event partners goes out to Mayor Kendall Lane, City of Keene, for his proclamation, “Music is Literacy;” Rev. Elsa Worth, St. James Episcopal Church; Rev. Patience Stoddard; Vice President for Diversity at Keene State College, Dottie Morris; Wade Garrett, sound; Gem Graphics, banners; Cheshire TV, videotaping; and Hannaford’s Supermarket for a tasty cake! Donations to support the work of The Schools Library project can be made online at http://www.participateforgood.com/projects/grand-monadnock-youth-choir-mandela-celebration . For more information about GMYC, or to sing with us, visit www.grandmonadnockyouthchoirs.org. Mandela philanthropic will is well established in his post-presidential office with a focus of “liberating children from poverty through improved literacy,” Since 2011, the Mandela Literacy Project has provided more than 100,000 South African children daily access to reading materials through containerized libraries with an additional 100 000 having access to reading clubs and books. The event begins at Noon in Central Square, with a rain location of the Keene Unitarian Universalist Church, 69 Washington Street, Keene. Rhoades will lead GMYC singers in songs of freedom and peace and welcome special guests, including Dottie Morse, Chief Officer for Diversity and Multiculturalism, Keene State College, and Mayor Kendall Lane who will issue a proclamation declaring July 18, 2018 as Music is Literacy Day to honor the life of humanitarian, visionary and peacemaker, Nelson Mandela. Thinking of Keene as a place that welcomes global collaborations is nothing new. Since 2002, Keene has been a Sister City with Einbeck, Germany, about 50 miles south of Hanover, exchanging official delegations, youth soccer programs and choirs over the years. The vocational school exchange began in 2015. There will be an opportunity for people to share their thoughts, enjoy a piece of birthday cake, and participate in an open drumming circle which starts at 11:45 (bring a drum). Attendees are welcome to provide birthday cards and personal messages in honor of Nelson Mandela. For those who are unable to attend, you are encouraged to upload your birthday message to the Nelson Mandela Day Facebook https://www.facebook.com/nelsonmandela so that the Monadnock Region is represented in this global tribute. Donations to support the work of 100 Year celebration of the Long Walk to Freedom and The Schools Library project can be made online at http://www.participateforgood.com/projects/grand-monadnock-youth-choir-mandela-celebration For more information, contact Esther Rhoades, esther.rh.rhoades@gmail.com or Susan MacNeil, susan@svidol.com. - Worldwide and specifically in South Africa, the statistics speak to the critical need for this initiative. - If all global children in low income countries left school with basic reading skills, 171m people could be lifted out of poverty. (Keene, NH) The audition schedule has been set for the 2018-19 season of the Grand Monadnock Youth Choirs, under the direction of Artistic Director, Esther Rhoades. Youth in grades 2-8 may try out for the Keene and Peterborough choruses, and girls in grades 9-12 for the Cecilia Ensemble. The music theme for this season is theatrical and stage performance. Keene auditions will be held in the parish hall of St. James Church, 44 West Street, on Tuesday, May 29 and June 5 from 3:00-7:00pm. Peterborough auditions will be held in the parish hall of the Peterborough Unitarian Universalist Church (PUUC), 25 Main Street, on Wednesday, May 30 and June 6 from 3:00-7:00pm. Arrive 15 minutes prior to scheduled audition to complete registration paperwork and receive your free t-shirt! Upon the retirement of Maria Belva this year, the Cecilia Ensemble will also now be directed by Rhoades. Cecilia auditions will be held in the PUUC on Monday, June 11 from 5:00-6:30pm. To schedule an individual 15-minute audition, or a “buddy” audition with a friend lasting 30 minutes, contact Rhoades by May 23 at 603-499-3505 or email grandmonadnockyouthchoirs@gmail.com. You may also schedule an audition online at www.GrandMonadnockYouthChoirs.org. GMYC tuition for the 2018-2019 season is $200 per semester, or $400 total. Tuition assistance is available through the application process. Rehearsals begin in September and occur weekly in preparation for the Winter 2018 and Spring 2019 concerts. Children’s Crusade in Birmingham, Alabama. 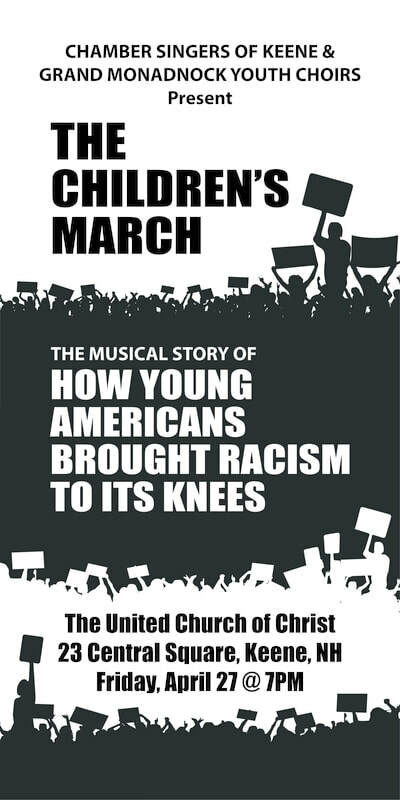 On Friday, April 27 at 7pm, the two Keene choirs of GMYC, Elm City Singers and Keene Youth Choir, will join their adult counterparts to present The Children’s March, a powerful musical depiction of civil rights activism. The concert will be held in the United Church of Christ, located at the head of the Square in downtown Keene, New Hampshire, and marks the first collaboration between GMYC and CSK. The evening holds special significance for the Chamber Singers. The group will host composer, Andrew Bleckner in the New England premiere of his work, featuring gospel, blues and dramatic themes representing the historic music sung by 4000 African American children as they were defiantly arrested to protest the inequality of the Jim Crow laws of the Deep South. College; conducted jointly by Matthew Leese, CSK and Esther Rhoades, GMYC; and joined by Walt Sayre, pianist and Michael Day, percussionist. This is also the farewell concert for CSK musical director, Matthew Leese, who took the helm at CSK in 2014. Leese finds synchronicity in this work within the context of national events. "When I found this piece and started planning with Esther, I had no idea this would be my final concert with Chamber Singers, but somehow this feels like a very fitting way to leave the baton for the incoming director. Working on this stirring piece this year has been uncanny in its timing with current politics and with me gaining US Citizenship." In the first week of May 1963, thousands of children demonstrated in the streets of Birmingham Alabama, protesting the city’s notorious practices of racial inequality. The events in Birmingham were not the beginning nor the end of racial discrimination in the United States, but they signified an important crossroads – one where the youth of the city proved they had a powerful voice to enact change, and where the politicians and law enforcement officials proved they would do anything to silence that voice. Met with a violent response as the whole world watched, the courage of these children, some as young as 4 years old, culminated in pivotal civil rights legislation proposed by President John F. Kennedy, making segregation illegal. The performance on April 27 serves an important call to action for youth and adults alike, an inspirational moment that will live on in the hearts of everyone who attends. As a gift to the community, and acknowledging the significant cultural contributions of Leese, tickets will not be sold and admission is by donation only. The inspiring concert will last approximately 75 minutes. Doors open at 6:30pm with unreserved seating. choir, known as the Cecilia Ensemble, has traveled abroad with Belva every two years since 2003. In 2018, the ensemble will travel on their 8 th European Tour. Previously, Belva took the group to Northern Italy in 2003; Germany and the Czech Republic in 2005; Spain in 2007, Sicily in 2010; Austria and Hungary in 2012; southern Italy in 2014; and France in 2016. This year they travel to the Czech Republic, where they will perform for six days in various locations ending in Prague. www.grandmonadnockyouthchoirs.org, or call 603-313- 0052 for more information. Artistic Director, Esther Rhoades was awarded one of eleven 2018 Trendsetter awards. While it can be said of all the recipients of the 2018 Trendsetter Awards that they’ve shown entrepreneurial spirit, strong work ethic and grit, a trait they also share is their dedication to giving back to the community they call home. Read more from the Sentinel Article here. (Keene, NH) The Grand Monadnock Youth Choirs (GMYC) began in 1997 as the Peterborough Children’s Choir, founded by Maria Belva. Recently Belva taped a show on Cheshire Television with Artistic Director, Esther Rhoades, hired in 2014 and promoted in 2017 to replace Belva as she stepped down from the helm of the nonprofit. Belva shared the chronology of how the organization began, an idea that sprung from a Raylynmor Opera production of “Hansel and Gretel.” As more students found their way to the Choir, they were grouped by ages until there were three children’s choirs. 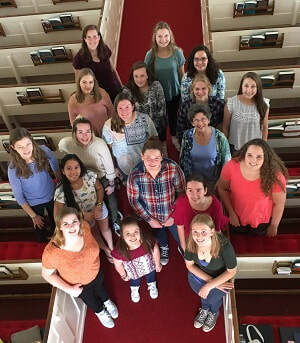 One of these choirs, the Cecilia Ensemble, is comprised of young women in high school who have had the opportunity to travel internationally every two years, singing for audiences in auditoriums, churches and even spontaneously on the street. This year they are traveling to the Czech Republic in April, performing for six days in various locations ending in Prague, where they will visit the Terezin Concentration Camp. This tour is very special because they will be performing a choral piece that was composed in Terezin by amateur musician, Karel Vrba, called Nezapomen, who was transported to Auschwitz shortly after the piece was completed. In 2005 the Cecilia Ensemble premiered Nezapomen in Peterborough while touring in Germany and the Czech Republic. This year they will return to perform the piece inside the walls of Terezin, 74 years after it was written. Their send-off concert will be held on April 15, 4:00pm at the Dublin Community Church in Dublin, NH. In 2017, under the leadership of Artistic Director, Esther R. H. Rhoades, GMYC expanded into Keene with two additional choirs while continuing to direct the two existing Peterborough choirs. Through these four choirs, GMYC provides performance-based choral music education to young singers in the Monadnock Region, grades 2-12, who gain proficiency in music literacy. Guidance provided by Rhoades allows young participants to appropriately adapt their unique, developing strengths. Youth learn how to work as a disciplined team, build personal confidence, strengthen listening skills and enjoy the accomplishments of their hard work. Audiences are delighted with their outstanding choral performances twice annually, spring and fall, in both Keene and Peterborough. The Board of the Grand Monadnock Youth Choirs (GMYC) is pleased to announce that Artistic Director, Esther R. H. Rhoades has been chosen for recognition as a 2018 Trendsetter by the Keene Sentinel and the Keene Young Professionals Network. In its fifth year, the program has recognized over 65 individuals under age 40 who make a positive difference in their workplace or community. In order to be considered, the nominee had to demonstrate excellence in workplace and community criteria. In 2015, the founder of the Peterborough Children’s Choir, Maria Belva, welcomed Rhoades in order to grow and strengthen the organization founded by Belva in 1997, with the goal of passing on the Directorship of the Grand Monadnock Youth Choirs (GMYC). With a B.S. in Music/Choral Concentration from the University of Delaware, Rhoades has already developed an impressive resume conducting private and public high school choruses in New Hampshire and Massachusetts, as well as the Keene Unitarian Universalist Church choir. Under her leadership, Rhoades leads five Monadnock Region choruses serving young boys and girls. In Keene: Keene Youth Chorus, grades 2-4 and Elm City Singers grades 5-8. In Peterborough: Trebles grades 2-4, Choristers grades 5-8 and the Cecilia Ensemble for young women, grades 9-12. In 2017, over 100 singers had the opportunity to explore musical composition, performance technique and the joy of accomplishment. Rhoades continues to build upon a storied history while advancing her unique vision. Involving the choirs with the community through annual events such as the Keene Tree Lighting and Dr. Martin Luther King, Jr. Breakfast provide musical opportunities that instill pride and pleasure. Engagement with other choral groups and organizations offers increased collaboration and visibility while underscoring the GMYC mission. In 2018 the Keene choirs' repertoire will continue to focus on the music of Civil Rights, specifically from The Children's March by Andrew Bleckner, collaboratively performed with the Chamber Singers of Keene under the direction of Dr. Matthew Leese. The Peterborough choirs will be performing music focusing on Human Rights including the South African National Anthem, the Estonian Freedom Song, and the Children's Declaration of Rights. The artistic leadership Rhoades brings to GMYC represents important growth for the organization. Business and foundation supporters, including the Putnam Foundation, have enabled GMYC to hire administrative staff and build funding capacity in order to serve more singers throughout a broader region of New England. Visit the website at http://www.grandmonadnockyouthchoirs.org/ . Call (603)313-0052 or email susan@svidol.com for more information. After 20 years of nurturing her children's choir and watching it grow, Maria Belva will pass the baton to another director this month. The Peterborough Children’s Choir, founded by Maria Belva and David Vernier in 1997, was created to give young singers the opportunity to develop their voices while learning the fundamentals: musicianship, music reading and performance among them. The Grand Monadnock Youth Choirs, under the direction of Maria Belva and Esther Rhoades, will present their 20th Annual Holiday Concert on Saturday, December 3rd and Sunday, December 4th. Titled Sure Stars Shining, the concert will include a variety of songs in celebration of the holiday season. Over 100 singers in all five concert choirs will perform: Trebles, Choristers, the Cecilia Ensemble, the Keene Youth Chorus and Elm City Singers—our newest choir section for singers in grades 5-8. On Saturday, the concert will be held in Keene at Keene State College Redfern Arts Center and begins at 6:30 pm. On Sunday, the concert will be held at the Peterborough Unitarian Universalist Church on Main St. in Peterborough and begins at 3:00. Both venues have handicap access. Tickets are on sale at the Toadstool Bookshops in Keene and Peterborough, and at the door. For information call Maria 603-924-2055. The Keene Youth Chorus is coming to the close of a very successful first year. 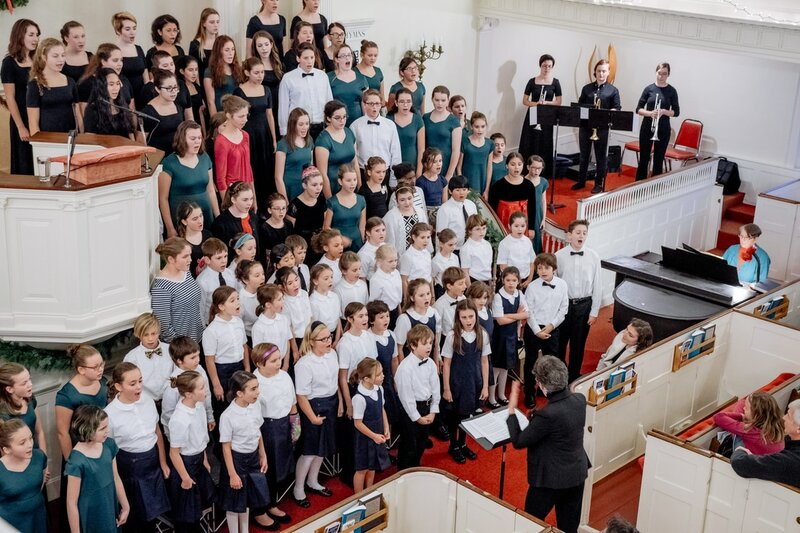 It is one of the choirs within the Grand Monadnock Youth Choirs, a nonprofit children’s choir organization founded by Maria Belva 19 years ago. The Grand Monadnock Youth Choirs has announced that Esther Rhoades, director of the Keene Youth Chorus, will be taking on new responsibilities within the organization. In addition to directing the Keene Youth Chorus, she will become the assistant artistic director of Grand Monadnock Youth Choirs, working closely with founder and the artistic director, Maria Belva. The Cecilia Ensemble, the Grand Monadnock Choir’s high school singers, are about to embark upon a life-changing experience. Next week, the girls will head overseas to France for a tour of historical sites and interesting venues, where they’ll perform several concerts comprised of American music. Choir director Maria Belva has led similar tours in the past, to other locations in Europe, exposing her singers to the rich history and culture of the old world. Belva has assembled a lineup of music by American composers, all in English, to perform in France. The concerts will include a quartet of Shaker hymns. During a holiday concert Saturday afternoon at St. James Episcopal Church in Keene, Cora Haines-O’Hara, left, Annelise Nicholas, center, both of Keene, and Indigo Love of Brattleboro strike a pose after singing “My Dear Mother” by Andrea Ramsey. The three youngsters are members of the Keene Youth Chorus, directed by Esther Rhoades. 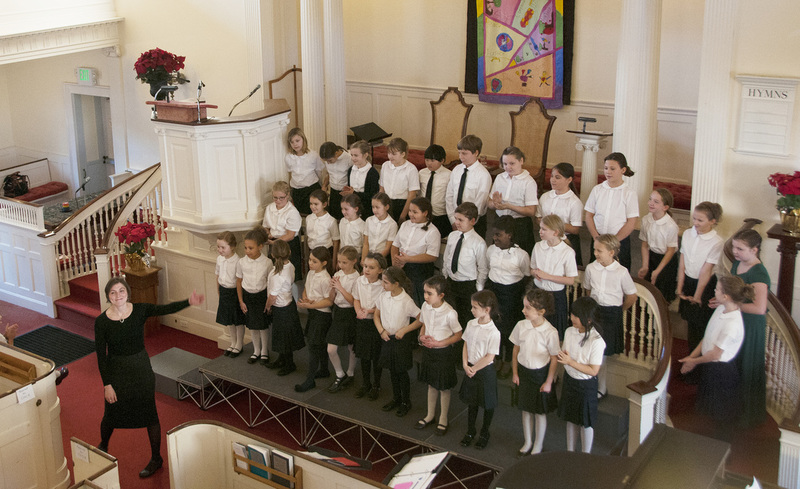 Children in 2nd grade through 5th grade make up the choir, which is part of the Grand Monadnock Youth Choirs, directed by both Maria Belva and Rhoades. Other singers shown are Raelen Leonard-Solis of Stoddard, Asher Elbers of East Alstead, Alexis Davis, Lily Swahnberg and Brooke Belden, all of Keene; and Laine Jane Dragon of Marlow. The youth choirs also performed Sunday in Peterborough. A new chorus group for children is forming in Keene and looking for singers. Grand Monadnock Youth Choirs is adding a section called the Keene Youth Chorus for children in grades 2 through 5, according to a news release from the nonprofit organization. The organization was founded in 1997 to provide music education and bring together young people who like to sing, according to its website. 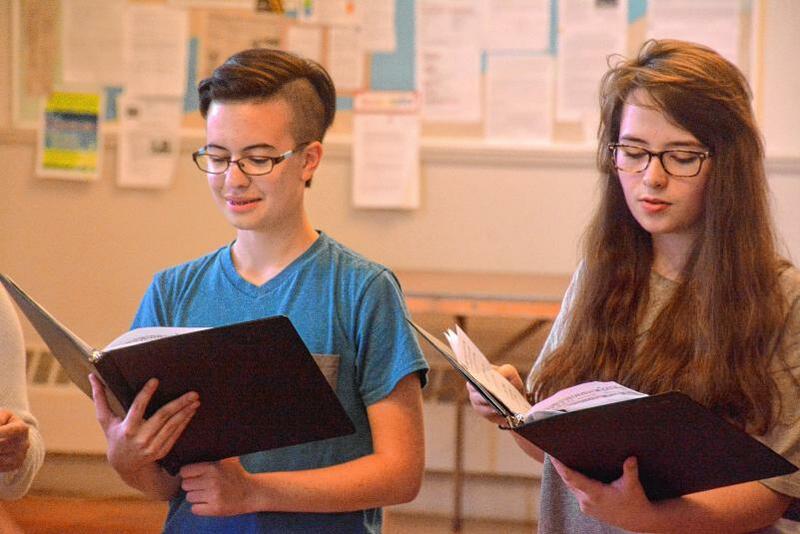 Maria Belva, founder and artistic director of Grand Monadnock Youth Choirs, said the chorus is a good opportunity for young musicians to build on the musical training they learn at school. "I Love Love to Sing"
When the Cecilia Ensemble — a choir of high school-age girls from across the region — performed in the Czech Republic in 2005, one of the singers addressed the audience in Czech, to which the audience erupted in applause because a foreigner had learned their language. In 2007, in the Catalonian region of Spain, another singer from the Cecilia Ensemble spoke Catalan to the audience, after which they also whistled and cheered.